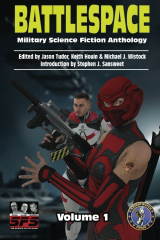 It is Veteran’s Day in the United States–a good day to feature the charitable anthology published last year by The Science Fiction Show: Battlespace–Military Science Fiction Anthology. The anthology is a collection of science fiction short stories and flash fiction pieces from authors around the globe. Volume 1 has a focus on the military, past, present and future. Conceived and produced by Jason Tudor, Keith Houin and Michael J. Wistock of the Science Fiction Show, Battlespace serves to raise money for wounded soldiers via the Warrior Cry Music Project. Battlespace has drawn unparalleled praise for its quality and purpose. Authors contributing to the anthology largely donated back to the cause everything they earned on the book’s publication. Many of the well-published contributing authors are veterans or have close ties to one aspect of the military or another, and the authenticity of the stories shine through. The reviews and ratings are solid on Goodreads. Battlespace was even featured on the Department of Defense Webcast and blog, “Armed with Science.” Click here for more about the webcast and blog. Warrior Cry can also be found on Warrior Cry’s Facebook Page and can be followed through Warrior Cry on Twitter. The Science Fiction Show (“SFS”) is an entertaining, professionally produced hour of audio entertainment about a broad spectrum of things in pop culture, science fiction, science, and so much more. SFS reaches audiences with great content and sharp wit. With better than 11,000 downloads, 50+ hours of programming, and 1,000 followers since May 2011, SFS is a fast-rising vehicle that appeals to broad demographics, reaching listeners through iTunes. Past interview subjects include comic book artists Steve Rude, Chris Trevis and Christian Waggoner; writers Mike Baron, Adam Slade and Eric Trautmann; author Paul Sammon; Charlie Adlard, creator of “Walking Dead”, and Hollywood special effects artist Shannon John Shea, among many others. The show’s website is www.myscifishow.com. You can also find the Science Fiction Show on Facebook or follow it on Twitter. Following is a trailer for the Battlespace Anthology. Battlespace is not for profit. 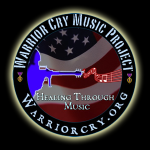 It is in support of those military personnel that can benefit from the extraordinary care and music therapy the Warrior Cry Music Project can provide. Please support the project this Veterans Day. 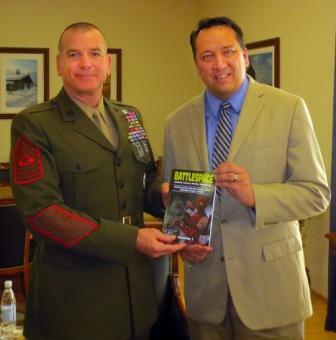 Battlespace can be purchased online at Amazon. It is available in print and Kindle formats. The stories are solid. The reviews are good. Enjoy the volume, and let’s all look forward to a Volume 2 in the near future. Gallery | This entry was posted in Battlespace, Charity, News, Science Fiction, Veterans and tagged Flash Fiction, Short Story, Veterans Day. Bookmark the permalink. I wrote about this last year, and very much enjoyed the book. If you haven’t purchased it, please do. Some of the proceeds go to help our veterans.